Patients Speak Up To Improve Medical Science — And Their Own Care : Shots - Health News Increasingly, advocates for patients are in the room when big medical studies are designed. They demand answers to big questions: "Will the results of this study actually help anybody?" 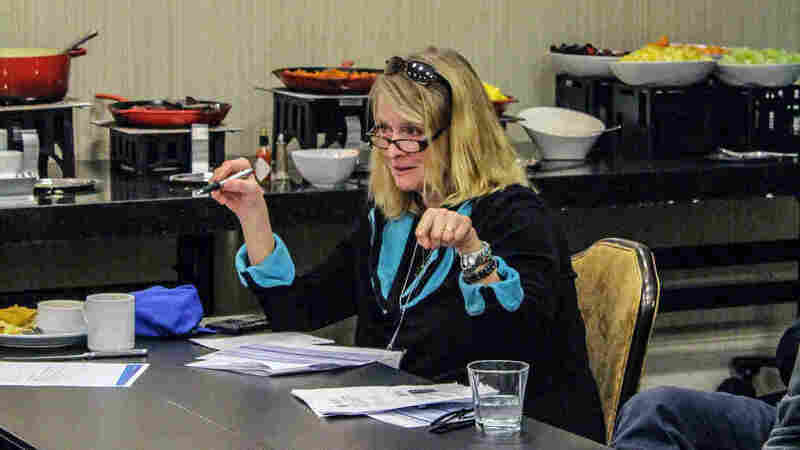 Nancy Roach at a conference in 2016. She's long worked as a patient's advocate and recently teamed up with scientists to help improve the design of studies, as well as to improve clinical care. The study is called the NCI-MATCH trial. It upends the normal way of classifying cancers for treatment: Instead of categorizing malignancies by the organ where they first appear, this method of sorting focuses on particular mutations in the genes of cancer cells. "Instead of thinking of a breast cancer treatment or a lung cancer treatment or colon, it looks at the different mutations that occur in the tumors," explains oncologist Robert Comis, who leads the study. NCI-MATCH recruits people who have tried and failed the traditional cancer treatments. People like 74-year-old Nancy Nahmias. "It all started when I was diagnosed with cancer of the liver," Nahmias says. "I was put on chemo, which I reacted very poorly to." In fact, she developed a severe reaction called sepsis, which put her in the hospital for six weeks. Standard chemotherapy was out of the question, her doctors told her. Nahmias' daughter, a physician, learned about the NCI-MATCH trial and encouraged her mother to give it a try. Scientists screened the genetic pattern of her tumor and found a mutation that might be amenable to a treatment not usually given to patients who have liver cancer. Nahmias signed up about two months ago, at Thomas Jefferson University, one of many sites running the study. The study has been recruiting patients at a record pace. In its first three months it enrolled 800 patients, far more than the 150 the researchers expected, Comis says. The organizers had to pause the study briefly, to reconfigure their labs to keep up with the flood of patients. That rapid clip is no doubt because the study is aimed at patients who are running out of traditional treatment options. But it's also because the researchers who designed the study stopped to ask what would appeal to potential participants. Nancy Roach, a longtime patient's advocate who lives in rural Oregon, got involved early on, and helped advise the scientists planning this study. "This is going to sound goofy, but my dad was in advertising," she tells Shots. "Remember the scrubbing bubbles — Dow scrubbing bubbles? That was my dad. So I grew up watching commercials and thinking about what consumers wanted." Roach brought that sensibility to the conferences where the NCI-MATCH trial was being designed. The original plan would have split the study participants who seem to be doing well on the test treatment into two groups. One group would continue the treatment; the other would take a break, called a drug holiday. I'm not a scientist. I'm not a clinician. I'm there on behalf of patients." Roach remembers her immediate reaction to that design: "Taking a patient who's responding to treatment and taking them off treatment? That is not going to fly." She correctly anticipated how patients like Nancy Nahmias would have reacted, as they deliberated whether to sign up for the trial. "I would not have liked that," Nahmias says. "If it seems to be working, let's face it, I don't want to do anything to sabotage myself." Dr. Peter O'Dwyer, a University of Pennsylvania oncologist who was involved in the study design, readily admits that "the design had certain attractions, but it clearly had certain flaws." On the one hand, incorporating a drug holiday would have helped doctors tell whether a tumor was just growing slowly, or actually responding to treatment, O'Dwyer says. On the other hand, the researchers could see the point that Nancy Roach and others in the patient advisory group were making. "We all agreed, and changed the design of the study accordingly," O'Dwyer says. That meant the scientists wouldn't be able to distinguish as easily the slow-growing tumors from ones responding to treatment — that insight would have to come from a follow-up study. Comis says researchers used to design studies without any patient input, back in the day when patients tended not to question their physicians. But just as patients have gotten more involved in their own care, their advocates have become more involved in the technical discussions of study design. "That has increasingly become the norm in the development of clinical trials," Comis says. He and O'Dwyer work together in Philadelphia at the ECOG-ACRIN Cancer Research Group. Years ago, Comis was involved in a landmark study that put cooperation with patients to the test. Back in the 1990s, doctors were increasingly encouraging breast cancer patients to undergo very aggressive treatment that involved having a bone-marrow transplant. The treatment, which can have serious side effects, was based on poor evidence, Comis says, so he wanted to run a rigorous trial to see if it really worked for this group of patients. "We struggled throughout the '90s to put enough patients on clinical trials, which ultimately showed that it didn't work," Comis says. Patients and their advocates, as well as doctors, really didn't want to question the prevailing wisdom about bone marrow transplants, he says. "And I think one of the reasons some of those early trials took so long was that the whole external environment was against participation in these particular trials." That experience validated Comis' view that patient advocates are central to doing good research. From Nancy Roach's perspective, it takes a bit of nerve to speak up in a room of doctors and scientists and ask, "Will the results of this study actually help anybody?" But it's Roach's responsibility to ask those basic questions. "I'm not a scientist," she says. "I'm not a clinician. I'm there on behalf of patients." Her own journey started when her mother-in-law developed colorectal cancer. Roach went from being an advocate for one patient to an advocate for many; she co-founded the Colon Cancer Alliance in 1999 and founded Fight Colorectal Cancer in 2005, advocating for those with cancer and their families. And while she's gratified to see more and more people stepping in to become patient's advocates in research design, she notes that most are white and economically advantaged. "Honestly," she says, "most of them look like me. And that's a problem." African Americans are under-represented in clinical trials, she notes. That may be in part because their doctors aren't recommending experimental treatments as often. But it may also be that the clinical trials haven't made a big enough effort to listen to the needs of various communities of patients. Roach hopes this will be the next frontier for patient involvement.